The architectural ensemble Nor Varagavank (Նոր Վարագավանք) is one of the outstanding monuments of developed medieval times of Armenia. It is situated 3.5 km southwest of Varagavan Village (till 1978 -Akhum village) of Shamshadin region on a high valley surrounded by woody mountains and picturesque ravines. Built in XII-XIII cc the complex is the result of building activities of the owners of Nor Berd- the Kyurikids. The cloister was the center of episcopacy and played an important role in their lives. In Nor Varagavank worked the religious and cultural figure of XIII c Hovanes Tuetsi. In XIX c the abbot of the cloister was Grigor Manucharyan, who in 1804-1828 together with his volunteer detachment took an active part in freeing the Eastern Armenia. In XII-XIII cc sources the ensemble is called Anapat. The newer name of Nor Varagavank is the evidence of one of the most horrible periods of history of Armenia. Running away from Vaspurakan's Varagavank which was destroyed by the Mongol's invasion, Patriarch Luke, who had a "Surb Nshan" (cross) with him, wandered looking for a new place and finally stopped at Anapat cloister, which in the honor of Varagavank was renamed Nor (new) Varagavank. The ensemble Surb Nshan is situated in the southeastern part of the complex. It is the most ancient erection of the ensemble. The church was built by the son of Vasak I, grandson of Kyurike II - David Bagratuni in 1198, is a two-apse church. It had a vaulted gable roof, which is not preserved. On both sides of the western entry two splendid ornamented khachkars are placed. They end with refined semi-circles. The apses are illuminated by two windows on the eastern facade crowned by a common belt on the top part of which are situated relief images of animals and stylized vegetable motifs. The two-storeyed burial vault joins the northern wall of the church Surb Nshan. The same David built it in 1200 as an ancestral script. The monument differs by its original volume-spatial composition. Over the original chapel-like building with a rectangular base (3.50x2.30 m) and vaulted roof built in the beginning of XIII c was attached a cylindrical structure with a conic end, from which the bottom rows of stone remain. On the first story, serving as bearing on the southern side are arches with bays 1 m high joining the church Surb Nshan, forming a divide under itself. The two-storeyed chapel joins the church Surb Nshan from south. It was built in the beginning of XIII c. It has a scheme and layout similar to the burial-vault. The difference is only in size (4.50x3.20m). It is supposed that the top tiers of either building served as side-chapels for the church. A removable ladder was used to access them. The church of the Holy Virgin is the most important building of the complex. According to the inscription and information, given by Kirakos Gandzaketsi, it was built in 1224-1237 by David's son Vasak II, and was illuminated in 1240. The architect was Gazan from Ani. The church is rectangular from the outside (10,25x15,40 m) and cruciform in the inside vaulted hall. In four corners there are two-storeyed side-chapels. Cantilever ladders decorated with stalactites lead to the second storey western side-chapels. The church has two portals from the western and southern facades. 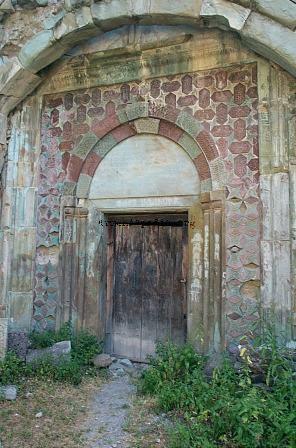 The western entrance differs by its magnificent decorative reliefs in multi-colored in-laid stones. A small vestibule joins the southern wall of the church and adjoins all three buildings of the Anapat complex (the original part of the ensemble). It was built in second quarter of the XIII c. Its layout was rectangular with two supporting pillars, of which remains the western wall with signs of carved cornices and adjoining light openings. The big vestibule is situated in the western part of the main church. By the northern and partly by the western walls it joins the rocks of the relief. It was built after the small vestibule in the XIII c. The square building with about 14 m sides, is covered without any supporting pillars help - due to the use of two pairs of intersecting arches. The vestibule has two entries from southern and eastern facades (the latter is a rare example of cult architecture). To the southwest and northwest of the complex two chapels (XIII c) are situated, by which there is an old cemetery. Khachkars of medieval and later periods can be found in the complex. Among them especially stands out the big khachkar in the big vestibule with images of human figures, created by master Vardan in 1620. Next village E is Varagavan (476 v). To reach the charmingly sited monastery of Nor Varagavank*, with S. Astvatsatsin church of 1237, Anapat 1198, David Ishkhan tomb/shrine 13th c, enter the village at the cemetery, then follow the main road through the village (when in doubt, always bear left), about 4.5 km through pleasant woods. This page was last edited on 30 March 2012, at 10:35.